The California Highway Patrol is hoping a new potentially dangerous trend doesn't gain any more traction on social media after videos posted show people jumping out of cars on Southern California freeways and skateboarding in the middle of traffic. "I am hoping it's not a trend that picks up. We want to get ahead of it," said Sgt. Jose Nunez, of the California Highway Patrol. Pro-skater Nakel Smith can be seen in one such video on the 110 Freeway skating behind another car in traffic. His manager told NBC4 Nakel is not encouraging anyone to do this. But it doesn't mean it's going unnoticed. "Are they endangering people? The answer is yes," Nunez said. CHP officers said lives are at risk, whether it's the pranksters or drivers trying to avoid them. 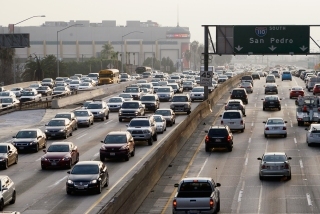 Those taking part in the "#freewaychallenge" could end up in serious trouble with the law. "It's pretty much reckless driving," Nunez said. That includes those behind the wheel, and those hitting record. "That's also aiding and abetting," Nunez said.